Solid mango construction and a 16-step hand finishing process make the quality and beauty of this chest of drawers evident. Two medium size top drawers and three large lower drawers with dovetail construction and metal drawer glides make it easy to access clothing. 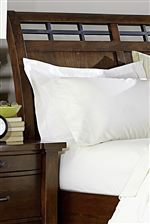 Its versatile contemporary style is an easy addition to your bedroom decor. The Whistler Retreat Solid Mango 5 Drawer Chest by Napa Furniture Designs at Beck's Furniture in the Sacramento, Rancho Cordova, Roseville, California area. Product availability may vary. Contact us for the most current availability on this product. Case Construction Solid mango wood construction. 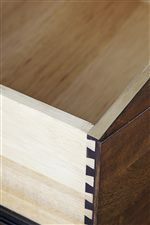 Mortise & Tenon construction throughout with corner blocking and dust proofing. Quality furniture made with strength of solid wood, this bedroom collection makes a beautiful impression on your bedroom decor. The mango wood grain is complemented with a 17-step finish to keep it looking great. Clean, contemporary lines make it perfect in any bedroom decor. The Whistler Retreat collection is a great option if you are looking for Contemporary furniture in the Sacramento, Rancho Cordova, Roseville, California area. 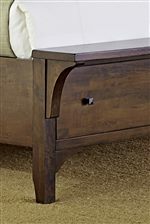 Browse other items in the Whistler Retreat collection from Beck's Furniture in the Sacramento, Rancho Cordova, Roseville, California area.